The hospital is on Wellesley Road. If you are using a SatNav the postcode for the hospital is S10 2SZ. Please be aware that parking charge notices are in operation within the hospital grounds. 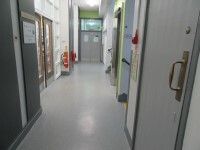 This is to ensure that ambulances and other emergency services have free access to the hospital at all times. To avoid being issued with a parking charge notice please make sure that your car is parked in a designated parking space. 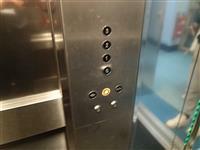 Parking is limited, so the hospital recommend using public transport if at all possible. 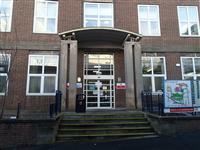 Travel South Yorkshire has created a helpful guide to getting the bus to the Royal Hallamshire and the central campus. A link to the relevant page has been provided in useful links located below. Travel South Yorkshire Information on Buses. 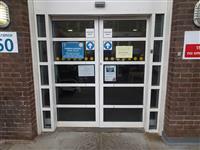 The Patient Advice and Liaison Service (PALS) is located in the foyer on Level B of the main Hallamshire hospital. 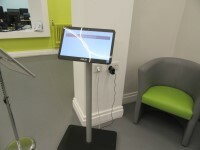 The telephone number for the Patient Advice and Liaison Service (PALS) is 0114 271 2400. The email address for the Patient Advice and Liaison Service (PALS) is PST@sth.nhs.uk. There are not volunteers available for help and assistance at the hospital. 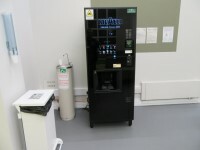 The alternative formats documents can be provided in include; Braille on request and large print on request. The car park is located at the side on Tree Root Walk. 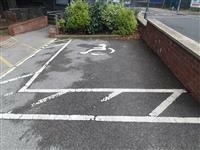 The dimensions of the designated Blue Badge parking bay(s) surveyed are 355cm x 475cm (11ft 8in x 15ft 7in). 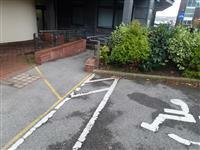 The nearest designated Blue Badge parking bay is approximately 10m (10yd 2ft) from the accessible entrance. 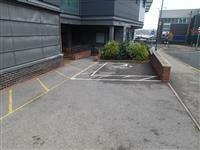 Alternative parking can be found at Jessop Wing on Tree Root Walk or at the multi storey car park next to the main Royal Hallamshire Hospital. This information is for the entrance located on Tree Root Walk. The width of the door opening is 178cm. The ramp/slope is located to the front and side of the entrance. 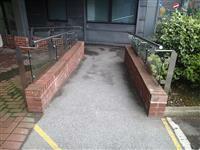 The width of the ramp/slope is 148cm (4ft 10in). 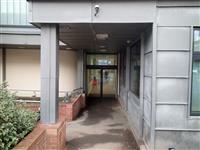 This information is for the entrance located on Wellesley Road. The width of the door opening is 121cm. The width of the door opening is 97cm. The ramp/slope is located to the right of the main entrance. 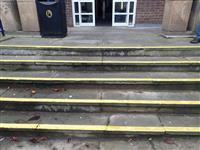 The step(s) is/are located in front of the main entrance. 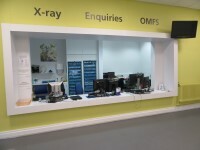 The reception desk is located to the left on entering the Main Entrance. 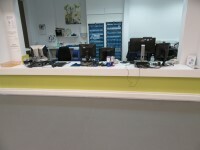 The reception area/desk is approximately 7m (7yd 1ft) from the Main Entrance. The lighting levels at the reception area/desk are bright. 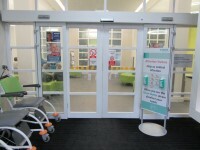 You are on Level Change (Inside Access from Accessible Entrance). Skip to the next section. 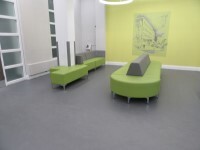 The waiting room / area is approximately 4m from the Main Entrance. 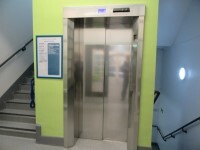 The dimensions of the lift are 117cm x 240cm (3ft 10in x 7ft 10in). 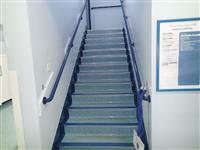 You are on Accessible Toilet (Ground Floor - Left Hand Transfer). Skip to the next section. 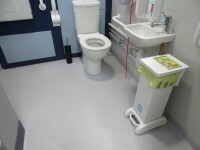 This accessible toilet is located on the ground floor main hospital corridor to the right of the lifts, next to the Paediatric Dentistry Clinic. 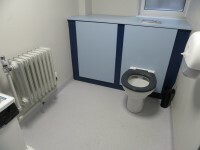 This accessible toilet is approximately 22m (24yd 2in) from the Accessible Entrance. 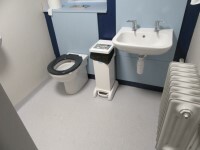 The dimensions of the accessible toilet are 190cm x 226cm (6ft 3in x 7ft 5in). The shelf is higher than 95cm (3ft 1in). 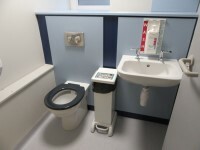 The contrast between the wall-mounted grab rails to the left of the toilet and wall is good. 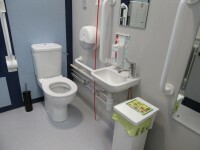 The contrast between the wall-mounted grab rails to the right of the toilet and wall is poor. 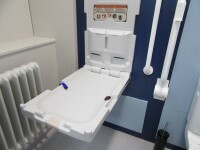 The height of the baby change table once extended is 120cm (3ft 11in). You are on Standard Toilet(s) (Ground Floor). Skip to the next section. 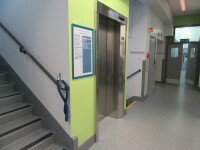 The female and male toilet facilities that were surveyed are located on the ground floor corridor, to the right of the lifts. 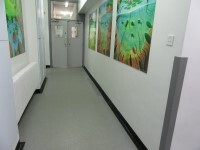 The female toilet facilities that were surveyed are located on the first floor corridor. The female toilet(s) is/are approximately 9m (9yd 2ft) from the lift. 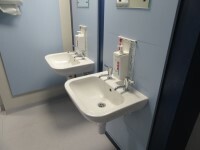 The male toilet facilities that were surveyed are located on the stairway between the ground floor and first floor. 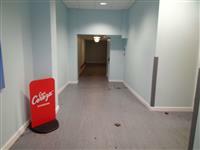 The male toilet(s) is/are approximately 10m (10yd 2ft) from the lift. 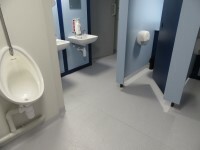 There are also female standard toilets available on the stairway between the first and second floors and also on the third floor corridor.